The Office of Admissions goal is to admit/recruit young women that are intelligent, talented and inspire to become strong female leaders. At Bennett you can look forward to engaging with respected scholars who provide transformative learning experiences to some of the nation’s finest students. As a graduate from Bennett you can look forward to joining the ranks of more than 7, 000 Bennett alumnae who make a significant contribution to our society. Now is the time for you to join our great “sisterhood”! Please complete the online application and follow the instructions given, if you have questions please call the Office of Admissions at 1-800-413-5323 or 336-370-8624 and by email at admiss@bennett.edu. Please CLICK HERE to request recruitment materials and to view the list of events we need your assistance in attending. 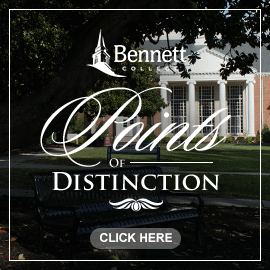 At Bennett College, from the day you enter the campus until your departure a transformation takes place. You meet other women from all over the country and from places around the world. Our faculty and staff become mentors who advise and guide you so you’ll be prepared for academic excellence and success in the world beyond.